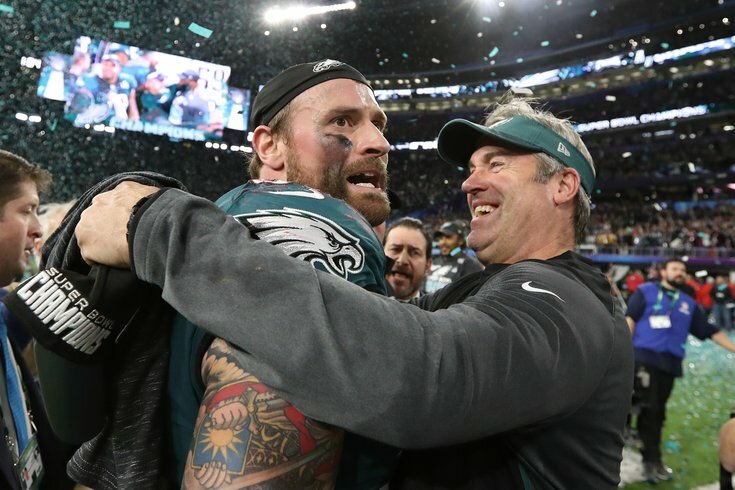 Philadelphia Eagles head coach Doug Pederson and defensive end Chris Long celebrate after beating the New England Patriots, 41-33, in Super Bowl LII. Chris Long doesn't care about money, at least not in the way most people associate with professional athletes. Last season, Long famously played for free after donating all of his game checks to charity. On the field, the Eagles' defensive end recorded five sacks during the regular season, forced the interception that turned the tide of the NFC Championship Game, and had a key role in bringing those now-famous underdog masks to Philly. In the end, Long was rewarded with a Super Bowl victory, his second in as many years after previously winning with the Patriots in 2017. And now, his current team is even willing to restructure his deal so Long can make (or perhaps donate) even more money this coming season. The offer would also reportedly extend his contract through the 2019 season. So, if the Eagles are doing Long "a solid," why hasn't he signed yet? Again, it's not about the money. According to Mike Silver, the 10-year veteran is mulling over a "football decision." As @fieldyates reported, the Eagles earlier this month offered to upgrade DE Chris Long's 2018 contract. The guaranteed money is actually in the $4 million range. However, Long has not yet accepted. Still mulling over what a source says is a "football decision" whether to return. Examples: Long had 14 QB hits & 33 QB hurries in 359 rush snaps. Some comparisons: 9.1 percent of his rush snaps were hurries, compared to Everson Griffen (7.4) & Olivier Vernon (6.3). 3.8 pct of Long's rush snaps were QB hits; Griffen (2.1) & Vernon (1.3) had lower rates. Final note: the Eagles' offer to Long is actually an extension through 2019. The 2018 salary of approximately $4 million would be guaranteed. A decision should come later this week. With the Eagles' defense getting even better over the last few weeks, especially along the line with the addition of Michael Bennett, perhaps Long is worried about his role on the team going forward. That's interesting for a couple of reasons, the most obvious being that a bigger offer from the Birds would be indicative of a bigger role, not a reduced one. Furthermore, Bennett's arrival doesn't necessarily mean a huge reduction for Long, since the team also got rid of Vinny Curry. In essence, Bennett replaces Curry as the backup right defensive end and Long continues to back up Brandon Graham on the left side. Where Long would likely see fewer snaps, however, is on third down (and in obvious passing situations), since Bennett would likely replace him in the team's speed rush package that includes three DEs and just one DT, instead of the normal 2-2 split. Last year it was Long, Graham, Cox, and Barnett in the Birds' NASCAR package. This year, it'll likely be Bennett instead of Long. Yes this is true. I’ve heard he’s wondered about his role going forward now that #Eagles have acquired Bennett. If that's the case, Long could ask to be released or traded, despite being offered more money and the extra year on his contract. Or, perhaps, it's something else. After winning back-to-back Super Bowls, maybe the soon-to-be 33-year-old veteran is thinking about retirement.